In the news, we have read of the desecration of memorials in Mount Hope cemetery. The Grand Lodge memorial that was splattered with oil has a long history. The land and memorial was donated by Bro. 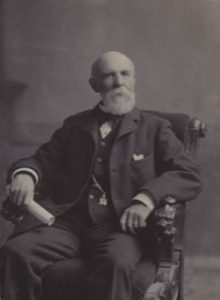 John Hoffman Collamore. He was made a Master Mason in Columbian Lodge of Boston, January 2, 1890. He was extensively involved in the Fraternity. 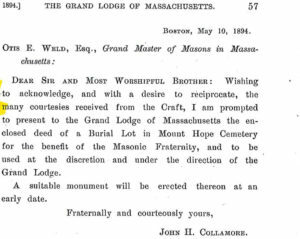 According Masonic Genealogy he was “a Royal Arch Mason in St. Andrew’s R.A. Chapter, Boston, April 2, 1890; and was created a Knight Templar in Boston Commandery June 18, 1890. The degrees of Royal and Select Master were conferred upon him in Boston Council June 19, 1890. He received the Ineffable Grades in Lafayette Lodge of Perfection, Boston, Feb. 7, 1890; the Ancient Traditional Grades in Giles F. Yates Council, Princes of Jerusalem, Boston, Feb. 14, 1890; the Philosophical and Doctrinal Grades in Mount Olivet Chapter, Rose-Croix, Boston, Feb. 21, 1890, and the Modern Historical and Chivalric Grades in the Massachusetts Consistory, S.P.R.S., April 25, 1890. At the session of the Supreme Council of the 33d and last degree, Northern Masonic Jurisdiction of the United States, held at Providence, R.I., in September, 1892, Bro. Collamore was elected to the honorary grade of Sovereign Grand Inspector General, 33rd degree. He was crowned with this grade at Chicago, Ill., September 19, 1893. His kindness will outlast the oil that besmirched his gift to the Craft.